What on earth was triceratops thinking? 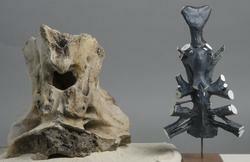 While Triceratops was a huge dinosaur, its brain didn’t quite measure up in size. While dinosaur brains don’t fossilize, we can get a sense of how small they are relative to the rest of its body by making a copy of the space inside their skull bones. Triceratops brain position: This diagram shows where the triceratops brain was postitioned.Courtesy American Museum of Natural History staff but it’s pretty close. The actual brain was slightly smaller surrounded by a membrane and fluid. Why bother to make an endocast? For one, it shows where major nerves proceed out to the dinosaur’s body. It’s also helpful in determining the correct elevation of dinosaurs’ heads. Want to learn more about dinosaur brains? Click on some of the links below. Are you feeling creative? Try writing your own label for these objects. • What do we know about the relative intelligence of dinosaurs?